Aspect Exhibitions are full service exhibition stand contractors. We’ve been supplying modular and custom built exhibition stands for indoor events since 1991. Over time, though, client demand for outdoor exhibition stands has steadily grown. Thanks to our all-round exhibition stand expertise, this is no problem! We build eye-catching outdoor event stands and exhibition marquees. Our aim is to deliver the best solution for your custom built outdoor display. 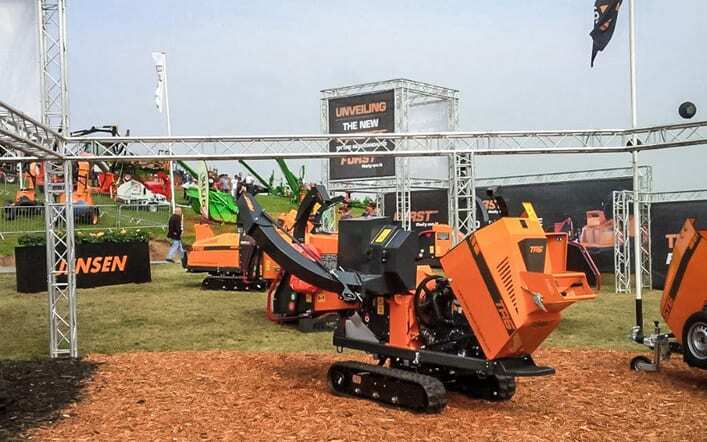 We help clients to exhibit successfully at the UK’s biggest and best agricultural shows. If, for example, you need a stand contractor for ARB, the Royal Welsh Show or AFP we can help. 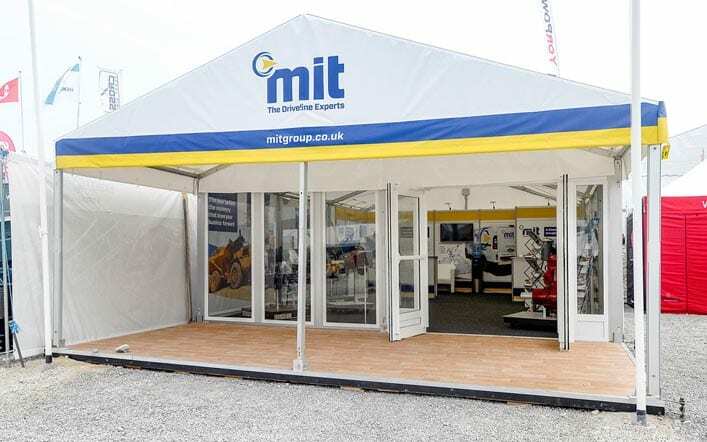 Whether you’re attending a small local trade show or a huge event like ‘Cereals 2018’, we can create a high impact outdoor portable display or exhibition marquee for you. We are an experienced outdoor exhibition stand builder and will expertly set everything up for you. We’ll also transport and install your own event marquee to and from the showground. With everything taken care of by us, you’re free to focus on making the most from the show. As experienced exhibition marquee contractors we know how to make an impact with corporate event stands. An impressive event marquee is a great alternative to an exhibition trailer. Why? Because event marquees offer more space and versatility. Our outside exhibition stands are based on high quality event marquees made in Germany. We own a range of 6.0m and 9.0m wide modules. These allow us to build exhibition marquees of any size from 6.0m x 3.0m to 9.0m x 15.0m. We also have a number of 5.0m x 5.0m pagoda-style event marquees. These are perfect for outdoor exhibition hospitality. They’re popular at Buxton’s Hillhead quarry show, for example. As well as marquee hire, we provide signage too. Eye catching outdoor banners lead visitors to your exhibition stand. Our custom printed PVC banners look great and are re-useable too! For info about our outdoor event stands, contact us now. 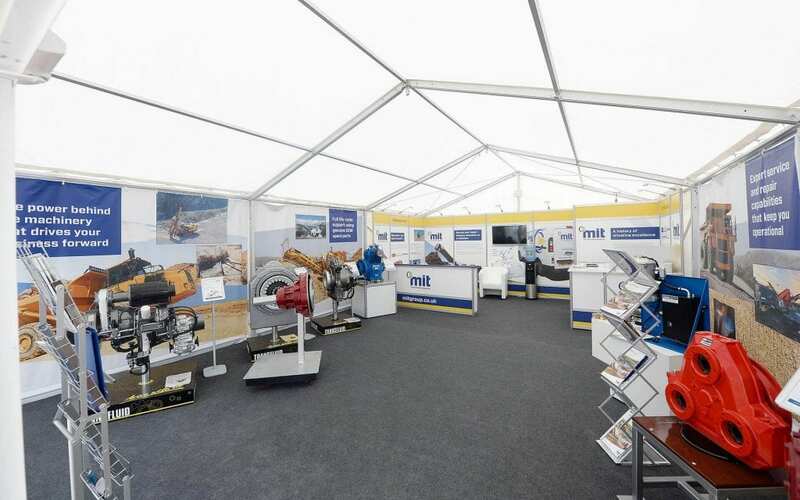 Providing suitable flooring is an issue for many outdoor exhibition stand contractors. We’ve tested lots of floors for outdoor event stands. This led us to design and create our own solution. Our exhibition stand flooring lies flat with zero bounce. It is reassuring to walk on and doesn’t creak or move. It can also be finished with various floor coverings. You could go for exhibition quality velour or cord carpet. Or you may prefer coloured or wood effect vinyl. We even offer a natural, stained or coloured decking. This is great for outdoor exhibition hospitality areas. 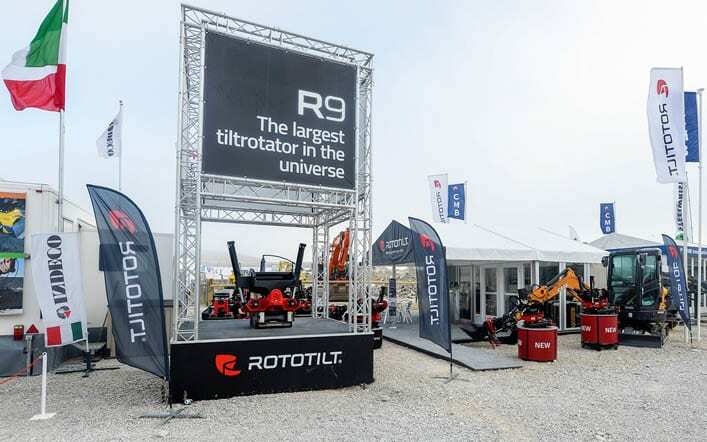 Your outdoor exhibition stands must give the right impression. They should look and feel professional both inside and outside. We can give your event marquee a true exhibition stand look and feel inside. This can be achieved in two ways. We can install one of our reusable modular exhibition solutions. (Custom graphics/stand elements can be re-used at future events). Or we can install a custom built interior, based on your own ideas. Either way, your outside exhibition stand will impress visitors. tell people who you are and what you do? It’s easy; just use our printed marquee panels. Forget flimsy PVC sheets held with cable ties. We use marquee grade material. This is custom printed with your design. Then it’s professionally finished with all the correct fittings. Remember, we can also print high quality PVC banners. These outdoor banners help to draw visitors to your stand. We’re experts with lighting truss systems. We use these to create high level branding and eye catching dividing walls. Making full use of height and width ensures your stand gets the message across. Creating high quality outdoor exhibition stands is only part of our service. We want to give you the best customer experience. So, we pay attention to detail. We’ll thoroughly plan and manage your project. We’ll handle all of the event paperwork. We’ll get your outdoor display or exhibition stand ready on time. And we guarantee we’ll never add ‘hidden’ extra costs. Some outdoor exhibition stand contractors cut corners. We don’t. Why not put us to the test? We attend countless outdoor events and agricultural shows. So, whether you’re looking for a Royal Welsh stand builder, a reliable stand contractor for AFP or help with exhibiting at any outdoor event, we’re here to help. Perhaps you’ve decided that exhibition trailers just don’t work for you, and marquee hire is a better bet. Whatever your outdoor display needs, we’re confident we’ll have a solution that works for you. For more information about our outdoor exhibition stands, please get in touch. We can also give you a free, no-obligation quote.